If you're a fan of the assassin’s saga and look forward to the release of Assassin's Creed IV: Black Flag PC version, then we would like to tell you the latest news about the editions in which this version of the game will be available. So, yesterday the publisher of this stunning action-adventure announced that the PC’s owners will be able to buy AC4: Black Flag in one of three offered editions: Standard, Deluxe or Uplay Deluxe. 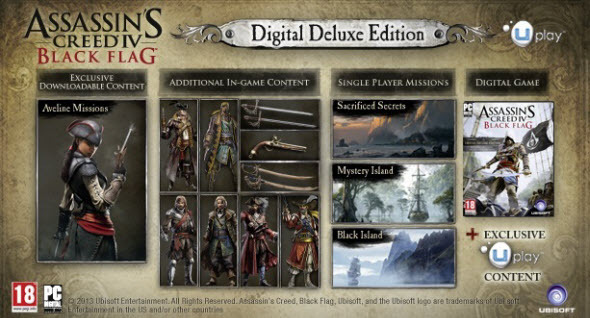 The first one will allow you to buy the game in the digital or box version, the second one - AC4: Black Flag Deluxe Edition - contains an additional game content: the new locations, the different things, allowing to customize the characters, as well as a campaign with Aveline de Grandpré in the main role. As for the third AC4 edition, it is an exclusive of Uplay store, and it provides you all content of Deluxe Edition and a bonus in the form of Pride of the West Indies pack (the additional gaming content for the single player). Also if you pre-order Uplay Deluxe Edition, you’ll get a 25% discount on the game’s Season Pass. But besides the abovementioned game’s editions, Ubisoft has offered us the collector’s ones: The Black Chest, The Buccaneer and The Skull Editions, the contents and the costs of which are described in one of our previously published articles. In the meantime, we are recalling that Assassin's Creed IV: Black Flag PC version, which has already reached gold status, will be launched on November 22, while its Xbox One and PS4 versions will be released on the 22nd and 29th of November, respectively.